My attention was recently drawn to a website where, on submission of a sample of your writing, you will be told which author’s style your writing most resembles. Naturally, I was intrigued. Being an unashamed narcissist, I was hoping that my writing may possess the elegance of Austen, or the clarity of Stevenson, or even perhaps – who knows? – the meticulous perfection of Flaubert, or the extravagant flamboyance of Dickens, or the epic splendour of Lawrence at his finest. So I submitted the entire text of an earlier post from this blog, and you know which writer their programme thought my writing most resembled? Dan Brown. Yes, Dan Bloody Brown. Now, I think I could reconcile myself to possessing Mr Brown’s literary talents if I were to be compensated with Mr Brown’s literary wealth, but to possess the former without the latter is really the worst of all possible worlds. The BBC believes that most people will have read only 6 of the 100 books below. How many have you read? Those of us with more time on our hands than sense to know how best to use it may even have completed the questionnaire, ticking off those titles we have read and checking our score against those of our Facebook friends. I know I have. There is no indication of what, if anything, this list is intended to indicate. If it is intended as a measure of how well-read or badly-read we are, it does seem, to be sure, an odd selection of titles. Is there really anyone who has read, for instance, both Ulysses and The Da Vinci Code? Or would want to? It seems highly unlikely to me. After all, the former can only be enjoyed by readers who love language and delight in its usage, while the latter can only be enjoyed by those who do not care much if anything at all about language: it is hard to see where the two may intersect. So what can a list containing both these titles possibly indicate? What could all these titles possibly have in common? This is the point where I should have shrugged my shoulders, thought no more about such nonsense, and gone off to spend my time more wisely by … oh, I don’t know … by reading a good book, I suppose. But good sense never was among my strong points: I went to the BBC site to find the source of this list. I couldn’t find it. The list contained in this Facebook meme seems remarkably similar to the results of the BBC Big Readers poll from some eleven years ago: I haven’t made a detailed comparison between the two – I’m not that obsessed! – but it seems fair to infer that whoever put together that later list had based it on the earlier. In the Big Read poll, the BBC had asked the British public to nominate their favourite book. I cannot after all these years remember whether they had stipulated that the book nominated must be a work of prose fiction, but certainly, neither non-fiction, nor poetry, nor drama featured in the final results. The poll was quite a big thing at the time; and in case anyone should think celebrating books is elitist – a vile and unpardonable thing to be, of course, either then or now – an article in BBC’s in-house listings magazine, Radio Times, helpfully informed us, as I remember, that this poll was intended to discover what we really liked, rather than what critics tell us we should like. And thus the BBC’s democratic credentials remained unscathed. Not that I look down on something like the Big Read. Far from it. Literature, as we all know or should know, isn’t a competitive sport, but most people realised, I think, that this poll was really no more than a bit of fun, and took it in that spirit. As a beneficial side effect, it spawned on the BBC site a discussion board, which very soon became a lively place with all sorts of people talking about whatever book they wanted to talk about, and at whatever level they were happy with: both inverted snobbery and right-way-up snobbery were conspicuous mainly by their absence. I made some very good friends on that board, many of whom remain friends still, long after the BBC decided, for reasons not entirely clear, to pull the plug on the board. As for the poll itself – all those books we really like rather than the ones critics tell us we should like – it ended up a rather predictable mish-mash: mainly modern and contemporary novels, with a sprinkling of a number of titles from the nineteenth century and the earlier twentieth century that we think of as “classics”; many books we have grown up with, and continue to hold in affection; a few highbrow titles (which presumably we do really like), and, to get it right up the critics, a few lowbrow ones also; but most, it seems to me, unexceptionably from the middle range. As one might expect, I guess. Nothing really to complain about – except for their ascribing The Alchemist to some chappie called Paulo Coelho when everyone knows it was written by Ben Jonson – but, perhaps, nothing really to get too excited about either. While this list is a reasonable measure of the reading tastes of the reading public, I’m not sure that counting up from that list the number of books we have read tells us much about how well-read we are. Perhaps, to get a representative list of books one should read in order to be considered “well-read” – a representative list, since a comprehensive list of this nature would be too vast even to contemplate – we should have asked the critics after all: for sometimes, even in our democratic age, it is no bad thing to be told what we should like by people who have spent much time and effort developing their understanding and their discernment. One may, of course, end up disagreeing with their choices, but such disagreement only carries weight when one can disagree from a comparable level of understanding and discernment. Otherwise, it’s rather meaningless. What sort of list would we have had, I wonder, if we had asked the critics? There are many titles in the Big Read list as it is that could very easily have made this hypothetical List of the Cognoscenti: few, I imagine, would quarrel with the inclusion of Pride and Prejudice, say, or of War and Peace, or of Great Expectations, or of Ulysses, in any list of great books. But wouldn’t it have been good to have had a list which, rather than confirm back to us what we already know and like, encouraged us to try out, maybe, The Scarlet Letter? Or Clarissa? Or Fathers and Sons? Or The House of Mirth? Or, if we expanded the remit beyond prose fiction, to, say, The Oresteia? Or The Odyssey? Or Njal’s Saga? Or Paradise Lost? Or, if we expanded the remit even further to include works of non-fiction, to, say, the Dialogues of Plato? Or The Histories of Herodotus or The Peloponnesian War of Thucydides? Or the essays of Montaigne or the Ethics of Spinoza? It’ll never happen, of course. It is not so much that we resent the idea of critics as such: after all, in this age of the internet, we are all, myself included, quite happy to become critics ourselves. What we find ourselves resenting is the idea that certain people, by virtue of their having spent time and effort applying their intelligence and their analytic skills to the study of literature, have developed keener discernment and understanding than the rest of us. And so, we end up merely repeating the same handful of titles over and over again, and we determine how well-read we are on the basis of how many of those titles in the list we may tick off. And we know – or, at least, I know – that the next time another such Facebook meme comes along, we’ll be falling for it all over again. I tend not to use this site for advertising, but since it’s my site, I guess I am free to break my own rules. For most of you, it won’t matter anyway: this post is aimed solely at those who live within reasonable travelling distance of Egham in Surrey, and who are free on the evening of Saturday the 15th – the Ides of March. For on that evening, the Egham and District Music Club, of which I am currently chairman, will host the distinguished pianist James Lisney in a concert featuring the three final sonatas of Haydn, Beethoven, and Schubert. The concert will be held in the United Church of Egham, on Egham High Street. You may find here details of the concert here. The piece by Haydn, I must confess, I am not familiar with. The Beethoven sonata is nothing short of visionary: that long variation movement with which the movement closes – and a discussion which forms one of the most memorable passages in Thomas Mann’s Doctor Faustus – takes us into regions of sound and of feeling that had not till then been imagined. You may see here Mr Lisney’s website, and the various concerts he has in his future itinerary. May I just say that our hall is a relatively small one, and it isn’t often one gets to hear a musician of such quality playing music of such quality from such close quarters. Have I sold this to you enough? No? All right then, if, during the evening you come up to me and mention this post, I promise to buy you a raffle ticket. Now, I can’t say fairer than that! As regular readers of this blog may have noticed – and I flatter myself there are a few regular readers – I haven’t been around much lately: I’ve been enjoying a few days in Vienna. And no – I won’t put up my holiday snaps: they aren’t, frankly, very good, and if you really want a flavor of what Vienna looks like, a quick browse through Google Images will give you a far better impression than any snaps taken with my cheap digital camera. Not even, MacNeice may have added, with a cheap digital camera. In many ways, Vienna is an endless celebration of kitsch. One knew that right away as the plane landed at Vienna Airport with the Blue Danube waltz piping out to the passengers. It’s all Viennese waltzes and Viennese whirls, chocolate cakes and apple strudels. And, like any major European city, tacky souvenir shops. I have a fascination with tackiness: I love browsing through cheap and tasteless souvenirs. The souvenir shops in Vienna are dominated by Mozart: Mozart coffee mugs, Mozart fridge magnets, Mozart mouse-mats, Mozart t-shirts, Mozart ties and scarves – anything at all you may care to imagine, but with a picture of Mozart on it. Why this unremitting focus on Mozart I wonder? After all, Beethoven was equally a resident of Vienna, and was no lesser a composer. There are also Haydn, Schubert, Brahms, and many, many others. Had any of these other composers been immortalised in tacky souvenirs, I would have been tempted: if I had seen, say, a Gustav Mahler coffee mug, or an Alban Berg baseball cap, I’d have had my wallet out right away. But these, I admit, I viewed and passed on. Of course, I had to make a pilgrimage to the Big Ferris Wheel at the Prater. I may not look or sound like Orson Welles, but I’ve seen The Third Man so many times over the years that I know Harry Lime’s dialogue by heart. I was going to recite the Cuckoo Clock speech at the foot of the big wheel, but at the last moment, decided I’d look something of a fool if I did, and chickened out. Perhaps I should have gone ahead with it: a few minutes of looking a fool is, after all, a fair price to pay for having been Harry Lime – if only for just those few minutes. And then, there was the Wiener Staatsoper, where I had cheapish seats for Tchaikovsky’s Sleeping Beauty. I was never was much of a ballet fan, to be honest, but I do love Tchaikovsky’s score, and, as far as I was concerned, hearing this music played so beautifully was worth the admission price on its own. So the restricted view didn’t really bother me much. However, when I stood up (I was at the back of a box with no-one behind me), I did get a pretty good view of them all prancing round to the music. And pretty damn good they were too. And then, the art galleries. Vienna’s most famous artist, Gustav KlimtI have never really liked: I have no idea how to define “kitsch” or “schmaltz”, but whatever they mean, that’s what I see in Klimt. And seeing his works face to face did not, I’m afraid, change my perception. Egon Schiele I found far more interesting. But – cultural conservative that I no doubt am – the greatest pleasure was a whole day spent at the Kunsthistorischesmuseum, which has one of the most wonderful collections of any gallery – Bruegel, Dürer, Holbein, Titian, Velazquez, etc. etc. And three splendid late Rembrandt self-portraits. And Vermeer’s extraordinary The Art of Painting. 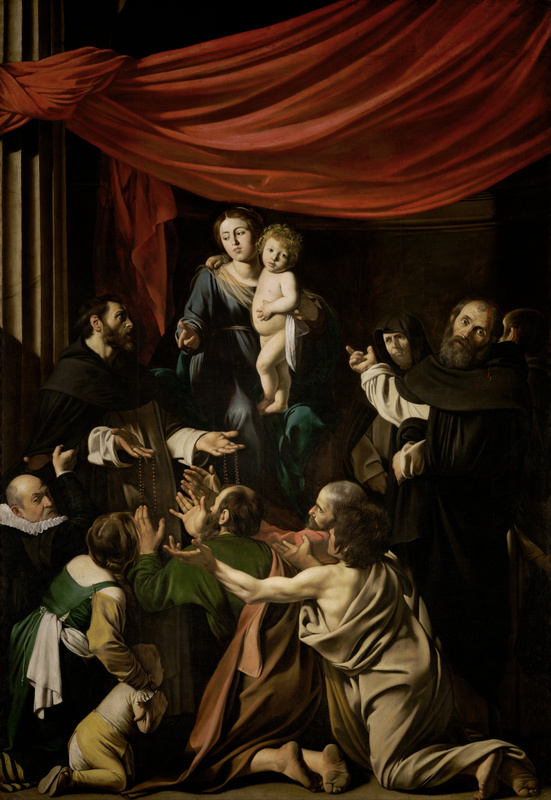 And some paintings by Caravaggio – most notably the Madonna of the Rosary – that fair took my breath away: I had seen this in reproduction before, but nothing quite prepares you for the experience of seeing this monumental work in the flesh, as it were. And speaking of flesh, there was Rubens. Lots and lots of Rubens. I’ve said it before and I’ll say it again – he who is tired of large naked ladies in fur wraps is tired of life itself.